A gas station attendant was shot and remains in serious condition after an attempted robbery in Northwest Philadelphia on Friday night. It happened around 10 p.m. on the 8900 block of Ridge Avenue in the Andorra neighborhood. The employee was closing for the night when he was approached by two masked men. One was armed with a semi-automatic rifle. They tried to take money from the register before shooting the attendant. The two men then fled. The employee was rushed to Temple University Hospital in critical condition. The two suspects are still on the loose. Two men were injured when shots rang out outside a bar in North Philadelphia early Saturday morning. It happened around 2:15 a.m. at Tabs Bar on the 2500 block of North 27th Street near Sergeant Streets. Over two dozen shots were fired during a dispute. Bullet casings were found all over the ground and at least one parked car was hit. The two victims are both in the 30s and were taken to Temple University Hospital. A gun was found in a vehicle used to transport one of the victims to the hospital. It is not known if that weapon was used in the shooting. No arrests have been made yet. Police are still investigating. Authorities are investigating a fire that injured a teenager overnight as suspicious. 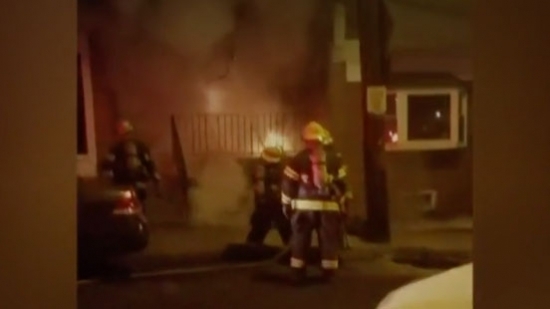 The fire erupted around 11:30 p.m. Friday on the 1300 block of Ruan Street in the Frankford section of Philadelphia. A 17-year-old boy was the only person home at the time. He escaped with minor burns to his arms and is being treated at Saint Christopher's Hospital. The blaze was brought under control by about midnight. The cause is under investigation but fire officials say it is suspicious.